This week, I’ve been posting Q&As with the authors of the first five Apocalypse Weird books. So far, I’ve spoken to Michael Bunker, Nick Cole, Chris Pourteau and E. E. Giorgi. Today, we have Jennifer Ellis, author of Reversal. Hi Jennifer, welcome to the site. Tell us a little bit about your Apocalypse Weird book, Reversal. 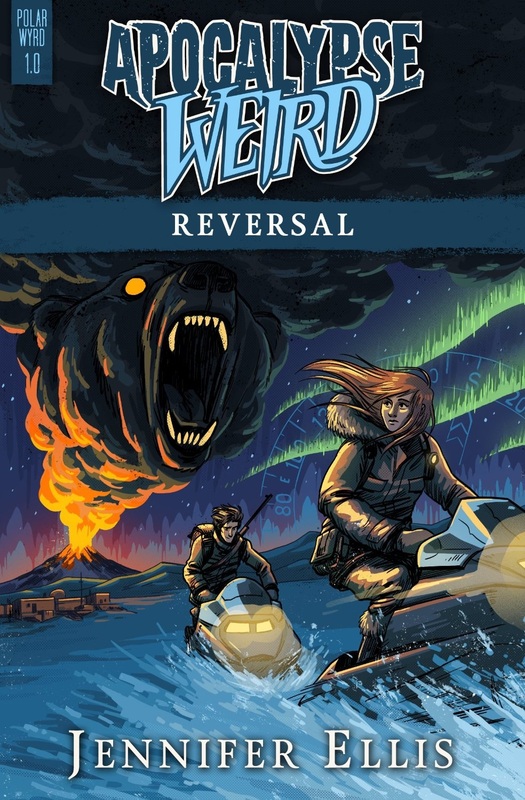 Reversal is set in an isolated research station on Ellesmere Island where Sasha Wood and Soren Anderson wake up one morning to find that not only are they blind, and several of their colleagues are missing, but the poles appear to have reversed and giant methane-venting craters have opened up all over the tundra. They are cut off from the outside world, and the other researchers keep turning up dead, or on snowmobiles with guns. What follows is an action-packed thriller filled with feral polar bears, trips to the Antarctic, the four horsemen of the environmental apocalypse, and many questions regarding Soren’s past and his research on volcanoes. The Arctic is an unusual setting for an Apocalyptic novel. What made you decide to set the book there? Well, I’m from Canada, and I live in a ski town, so I love snow and generally prefer to spend six months of the year surrounded by it. I also thought a colder setting would be a nice contrast to the more southern settings that the other launch authors had selected. The stark setting also lends itself to a lot of apocalyptic possibilities, in terms of climate, volcanoes and giant methane-venting craters. Being a geographer, I’ve had friends who have done northern research and I’ve always been fascinated by their stories, and I had just finished reading an account of Shackleton’s ill-fated voyage to the Antarctic, which was full of icy adventure (and penguin consumption). And since I live in the mountains, we have a lot of black bears in town throughout the summer. I always have to be looking over my shoulder when I go for a run. So I wanted a setting that at least in part reflected my own experiences in the woods. I like all the twists and turns and geomorphological science I was able to incorporate. This is the most true science fiction book I’ve ever written and it was very freeing to be able to just let my imagination run wild and make it a non-stop adventure, and yet still stay true, or fairly true, to science. Mass extinction events have always interested me, and a lot of the information I turned up in my research regarding super volcanoes, pole reversals, solar flares, and magnetic jerks just happened to very usefully fit itself into my storyline. I’m also happy with all the characters and the dogs. Once I had created them and put them into place, they all seemed to come together and form a great team that practically wrote the book themselves. I’m going to have to give the penguins the opportunity for revenge in book two though. How did you get involved in the Apocalypse Weird project? I met Nick Cole and Michael Bunker through my involvement in Synchronic: 13 Tales of Time Travel, an anthology that came out last spring. I got to know them via Facebook and then I worked with them both in the Tales From Pennsylvania anthology. They are super easy to work with and true professionals, and, as you might have noticed, they are certainly not dull. I’m not sure they even know the meaning of the word dull, which is why they are both such great writers. They have certainly changed the nature of my Facebook feed forever. So when they had this idea, and they asked me to come aboard, I said yes, with little reservation, because I knew that no matter what, it would be a heck of a lot of fun. A big thank you to Jennifer for taking the time to answer my questions. Reversal, (and five other Apocalypse Weird novels) is available now on Amazon.